MARK ANDERSON, Key Note på Radar Summit! “The technology landscape. Who survives and who will die” Mark Anderson, en av världens mest inflytelserika påverkare inom IT, kommer till Sverige för att tala på Radar Summit 2017. Stephen Waite, Co-Founder and Co-Executive of the Graphene Stakeholders Association moderated a panel regarding the cutting edge technology of additive manufacturing. 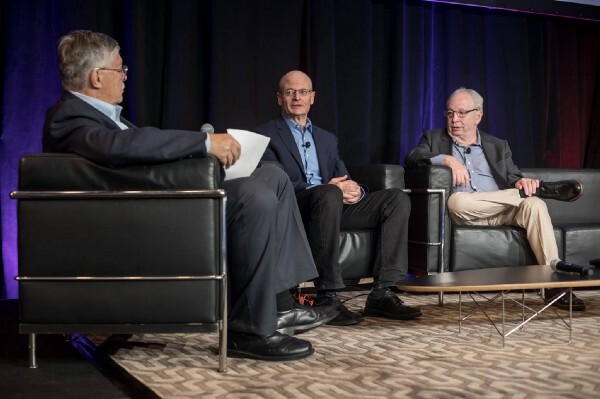 Trevor Rudderham, CEO of Haydale Technologies, Shane Fox, CEO of LINK3D and Phillip Vafiadis, Executive Chairman of Innovyzl contributed their expertise to the conversation on how 3D printing is changing and will continue to change the manufacturing industry. The panel began with Waite stating that so often we see investment dollars being put only into tech companies. He noted the enormous economic opportunities that there are with additive manufacturing. The fusion of technology with manufacturing will create major growth in the industry. He shared that 3D printing is expected to be a 20 billion dollars industry by 2020. By 2025 it is expected to have grown to 100–150 billion dollars. “Humans think linearly, technology thinks exponentially, and that is where things get interesting,” said Waite. Waite looked to Vafiadis for an explanation of some of the things his budding 3D printing company Titomic is doing. Vafiadis explained the cold fusion technique they are using to create better metal, 3D printed parts in a faster and cheaper way. He also told of a new material he recently held that acts like titanium but is more malleable and doesn’t react to heat and cold. Waite turned the conversation to how materials themselves will become technology and invited Fox to tell how his company, LINK3D, is the embodiment of that. Fox spoke of how metallurgists are creating new materials, allowing for design without borders. He mentioned how technology typically makes our lives better and cited the improved environmental impact that additive manufacturing will have as an example of that. “You can recycle almost 99% of the materials used in industrial 3D printing these days,” said Fox. 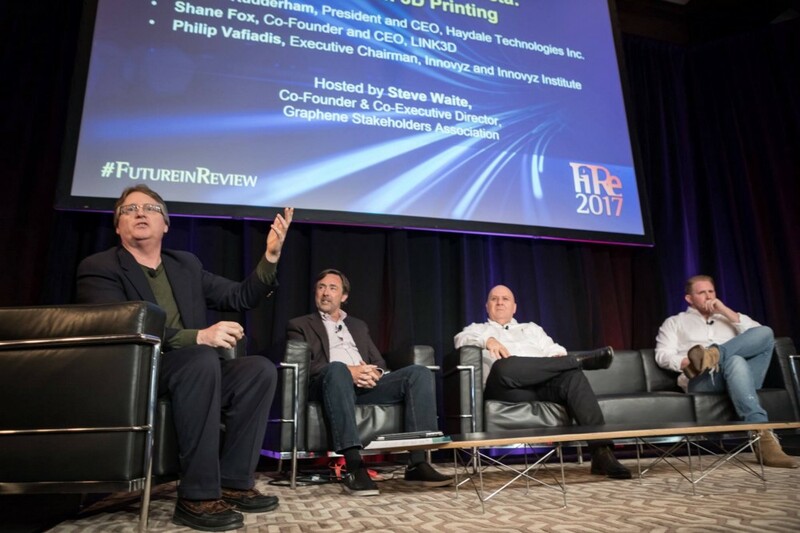 Rudderham finished up the panel by commenting on the changes that 3D printing could bring into the automotive industry. He explained that tooling costs to make changes to car designs require an long run time of any product in order to recoup the investment. With additive manufacturing, you can change designs with a tiny amount of cost. “You could even get into mass customization,” said Rudderham. 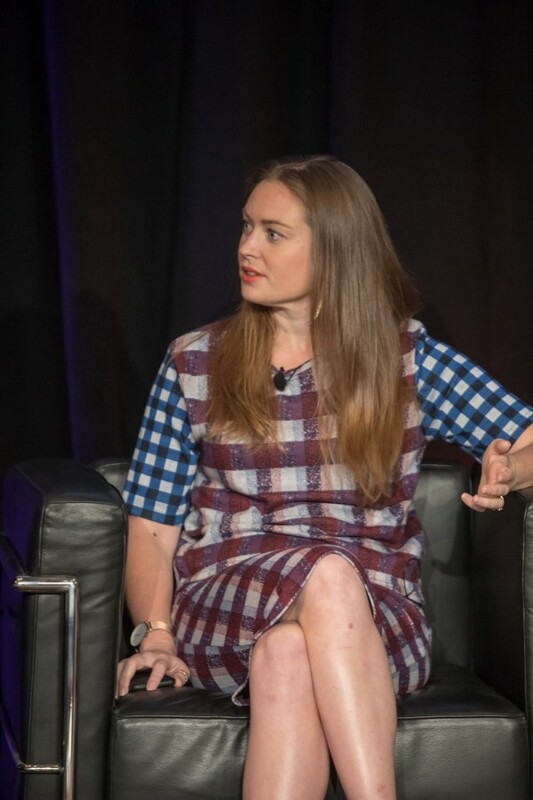 In an arresting afternoon session on day 3 of the Future in Review conference, Cynthia Figge, CEO and Co founder, CSRHub moderated a panel consisting of representatives of companies that could complete Mark Anderson’s carbon trifecta. 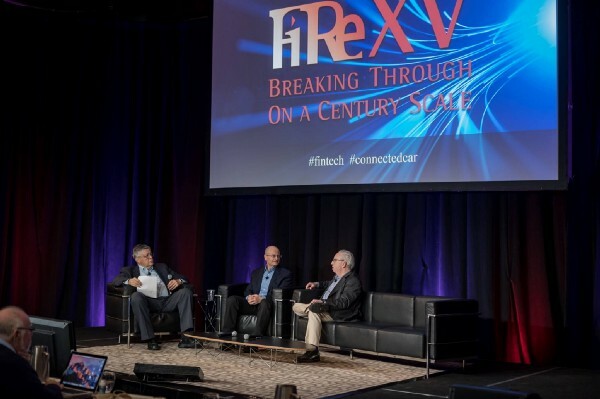 Will Perego, Founder and CEO, 24-Hour Solar Roof, Mark Godsy, CEO, Exro Technologies, and Ray Gibbs, CEO, Haydale came together to offer their perspectives on building Elon Musk’s vision of a sustainable energy future. Figge set up the session by defining the three parts of the Carbon Trifecta: carbon capture, especially via direct air capture, processing CO2 into useful carbon based materials like graphene, carbon based polymers etc., and 3D printing. To contextualize the companies’ work, Figge asked the representatives what their companies do and how it applies to the Trifecta. Pereo started by speaking of his passion about real estate and sustainability and how clean energy was the next logical step. He also spoke of his fortune in being at a time and place where his aspirations could be realized and how those not at the right place should be helped. Godsy took a more statistics driven description of Exro’s future. He underlined the need for sustainable energy, because each year, human are putting in 36 million tons of CO2 into the air. Even signatories to the Paris Climate Accord, he said, fall short. In a more direct rejoinder to the responses, Figge further drilled into the problem of scalability, asking how the companies aimed to scale. Perego said that solar is growing exponentially, and how he envisions 50 percent market penetration in approximately 20 years. Already, he said, solar is the cheapest energy source in several states, so as more people switch to solar, a virtuous cycle will establish itself wherein existing utilities’ prices will go up. Godsy told a story in the Bahamas, where he met an electric engineer whose eyes welled up at the mention of Exro’s vision of using tidal energy to generate power. “Ever since I was a boy, I dreamed of these waves will power our island,” said Godsy, quoting the engineers. Gibbs chimed in by talking about the size of the composites market. “Composite materials market is 100 billion dollar market,” he said. He spoke further of the energy savings that could be made if composites were replaced with nanomaterials and the savings that could be made by using graphene, which is a great head dissipator. Asking about what the companies were doing right now, Figge quizzed the companies on what they were doing currently and if any new products were coming up. Perego started by saying that 24-Hour should have a fully functioning unit by years end. The next year, a product for flash charge batteries is coming up. Finally, he expressed the need for the company to allow for neighbors to trade their renewable electricity among themselves. Godsy said that Exro’s business plan is a combination of chess and dominoes. Three prototypes are being created internally, and four technical areas are being commercialized: generators (propulsion systems for drones), motors (confidential), reversible machine for bicycles, and the wind initiative. He shared his vision of seeing their technology in at least half a billion machines. Gibbs started by mentioning an element of waste often overlooked. He said the oil and gas industry has leaky pipes, which are huge polluters, saying that the repair bill for a Saudi company is a billion dollars a year. He said that many problems could be solved using silicon carbide. Figge ended the session by asking what the financial models for the developing world are. Perego started by pushing for a pay-as-you-go model, giving the example of building a center with a 24-Hour Solar Roof for electricity and water and how time and money could be saved. Godsy said that there’s abundant energy that could power the entire country with tidal forces. He said that they hope to be an important player so as to have people have access to things. Gibbs ended on a driven note, when speaking about the need for water. “It’s criminal that people in developing countries don’t have access to water,” he said.